“Hello,” said the voice on the phone. “My name is _______. I know you never expected a call from me, as famous as I am, but I’ve been given your name as someone who can help me _______. Write a story that follows this line. You’ve scheduled a root canal and the dentist finishes up. You pay and head to your car. Once in your car you hear a voice (from the tooth) that informs you that the dentist inserted a government device in your mouth and you’re needed for a secret mission. What happens next? I have never done anything unpredictable, but that changed today when I woke up, packed a bag, went to the airport and randomly bought a ticket to _______. Write a story that follows this line. As always, you don’t have to take part in this writing challenge. But you’ll have fun if you do. The 2018 story collection from Kansas Writers Association has just been released. 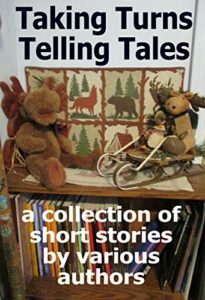 Taking Turns Telling Tales is a collection of varied stories in different styles and genres from 17 authors. There is something for everyone. The October 20th meeting will focus on writing dialogue and more. Gloria Zachgo and David Heffelfinger will present the double program. You’re walking home from work one night and taking shortcuts through a labyrinth of dark city alleyways to meet someone on time. Suddenly a stranger parts the shadows in front of you, comes close, and asks you to hold out your palm. You oblige. Describe an event that changed your life forever, or make up and describe an event that would change your life forever. How do you know someone loves you, even if he or she doesn’t say it? If you don’t like any of these prompts, please feel free to make up one of your own. If you would like the group at the meeting to critique your story prompt, please bring copies. It is much easier to critique if they can follow you on paper and make comments rather than try and remember. Bringing copies is not a requirement to do a prompt – THIS IS ONLY AN OPTION. Writing prompts are provided to challenge our members, to get our creative juices flowing. If you haven’t joined the fun, now is your chance. What would you do if you could travel free anyplace in the world? If you had $100,000, how would you spend it? If you could do something you never have done before, what would it be? Why would you want to do it? As always, if you have a different prompt that you would like to use, do it! The Wichita Public Library is having their Third Annual Local Author Day September 8. The day begins with a panel on the pros and cons of self-publishing; next, meet with your favorite hometown authors and see what’s new in Wichita’s literary world. Authors will have available copies of their books, including adult and children’s books. Check out the link for more information on the event and for how to sign up as an author. The August 18th meeting will be a time of learning, a time of sharing our experiences on the subjects of the month. Drum roll here… The subjects are Cliff Hangers, Plot, and Theme. Kathy Pritchett will present a program to start the discussions off. Come prepared to learn something new. Come prepared to share your experiences pertaining to these subjects as a writer. And don’t forget to try one of the writing prompt challenges. Or come up with your own writing prompt. I have never been more frightened than when…. What would you do if the Internet quit working? What would you do if someone just gave you a $1M dollars? Be a building you know well. Talk about your life and memories. If you have a different prompt that you would rather use, please do so. What if the use of robots in school becomes a workable reality? You have just met an alien from another planet. He wishes to take an earthling back to his planet. Convince him you would be the perfect specimen for him to take. What would you do if you were able to communicate with animals? Ready for some new writing prompts? If you could be a character in any book, TV show, or movie, who would you be and why? If you had a chance to live anywhere you could, where would it be and why? If you don’t like any of these prompts, please make up one of your own. As usual, we are supplying some writing prompts to challenge our members. If you don’t like any of these prompts, you are welcome to come up with one of your own. What would you pack in your suitcase if you could not go home again? Write about a day you’d like to forget.